Cleaning out my closet is one of those activities that’s not always easy, but I’m always, always happy once I’ve done it — especially when I’ve done it really thoroughly. It’s kind of like a tough workout in that way, right? You approach it with mixed emotions — a little dread, a little excitement. You get into it and sometimes, boy, it can be a struggle — mostly emotional, but depending on just how much you’re getting rid of, I suppose it can be physically challenging, too. But every time you finish a nice big closet purge, oh, it feels so good. It’s an accomplishment, for one thing, and don’t you feel so free without all the extra stuff that you never wear but have kept it around anyway? 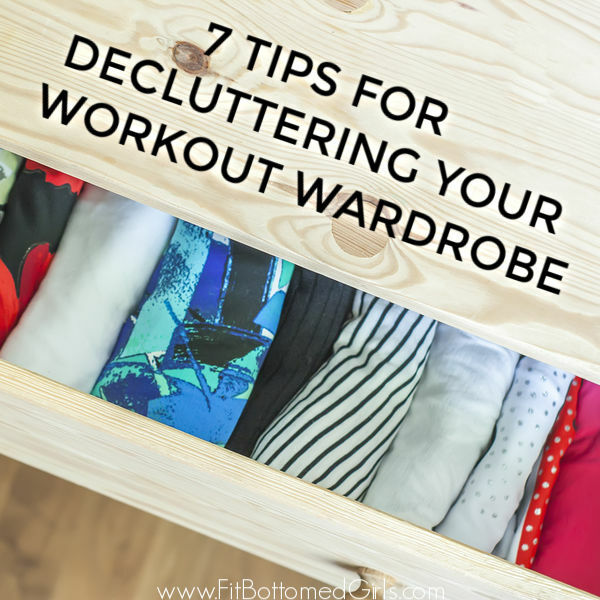 And it gets even better when the things that no longer serve you are still in good shape and could make someone else really, really happy — which is all the motivation I need to take another pass at my closet, this time, focusing on my workout gear. Because, here’s the thing — I’m really lucky that, in my job, I receive a lot of cool running and workout gear from our friends at Brooks Running (where we’re affiliates, FYI). We’re OBSESSED with the Ugly Sweater Levitate 2. 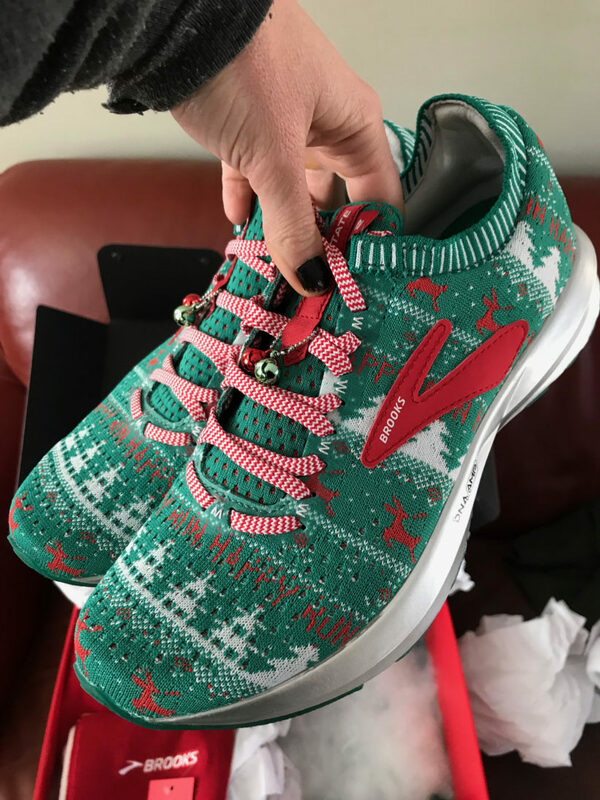 Did you catch our Instagram post (previewed above) about the Ugly Sweater Levitate 2 shoes that Brooks just sent us? OMG, we are going to be jingle jogging non-stop for the next month. They are sincerely the CUTEST, and that springy, energy-returning DNA AMP midsole just gives and gives so it’s totally like Christmas — or insert gift-giving holiday of choice here — every time we set out for a run. Anyway, I’m really never at a loss for great shoes and gear to wear for my workouts, which means that, at least a couple of times a year, I can take a look through my workout clothing drawers and pull out some items that are still in great shape — and are still totally on trend — that simply aren’t getting much wear anymore. Which means that there are some runners out there who are about to luck out. As great as it feels to get rid of your excess stuff and give it to someone who could use it, it can also be really difficult to actually part with it. Trust me, I know — maybe you fluctuate a bit between sizes, maybe a certain shirt reminds you of your first marathon, maybe you keep thinking that the perfect opportunity to wear that funky running skirt will appear — it just hasn’t quite yet. But I’ve got a few simple tips to make this purging process pretty painless. 1. Get your mind right. My motto going in is always, “Ruthless.” I recommend coming up with something similar. If you start out wishy washy, you will not succeed in this mission (unless you count getting rid of that one stained race tee success — and I do not). 3. Ditch anything that’s stained, torn, worn through, or otherwise in bad shape. Do you need it? I’m betting the answer is no. Lose it. 4. Pull out anything you haven’t worn recently — and be honest with yourself about why you haven’t pulled it out until now. Often, the answer is that we have something similar that we like a bit better, or maybe it doesn’t fit exactly the way we’d like. I also run into a lot of items to which I have an emotional tie — a race tee, or something that was a gift. But look, you’re not doing anyone any favors by keeping something at the back of your drawer. Let. It. Go. 5. Smell it. No, seriously. This is workout gear, so whether you’re keeping it or not, give it all a good, long sniff. If there’s any hint of odor now, you know it’s gonna be way worse 10 minutes into your workout. In those cases, skip the donation and go with the kindest option — the garbage. 6. Scope out your shoes. Yes, it’s fair to want to keep a few pairs handy — something for long runs, something to wear when it’s rainy, another pair for the gym, and maybe some for yard work. But be realistic as to how many you’re keeping, and why you really want them. It’s okay to have a collection, but maybe also consider whether a couple of those sneakers would get better use from someone who’d actually run in them. 7. Deliver the goods ASAP. The longer that bag full of goodies sits around, the more likely you are to decide you’ve made a terrible decision and go rummaging around in it. Get that out to the garage, at least — maybe in your trunk, or hey, perhaps your neighbor’s trunk. Just get it out of sight, out of mind, and into the hands of someone who’ll love and wear it as soon as you can. Then, if you see something you just can’t live without, you can hit click buy with confidence that you’ve got room in your closet! Oh, and one other cool option! If you don’t have gear to give right now, consider giving your time — and miles — this holiday season! Brooks recently announced the 25 schools it’s giving Booster Club need-based grants to this year (which will help high school cross country and track teams by providing performance running footwear and apparel as well as funding to under-resourced high school cross country and track teams across the country). And we can all help out by getting involved in the Brooks partnership with Charity Miles — use the Charity Miles app to log your runs, and once the Brooks Booster Club hits 10,000 miles, a donation that’ll provide for two additional schools to receive Booster Club grants next year will be unlocked.